I love barbeque. For me, that exceptional mix of spices and ketchup always delivers. So when I was offered the opportunity to experience experimentation in barbeque chicken, I jumped at the opportunity. 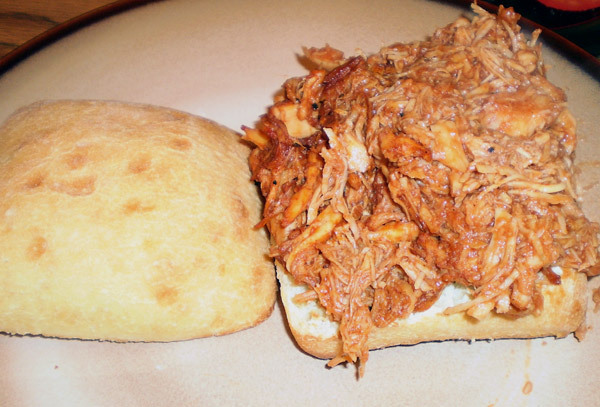 The entrée – pulled barbeque chicken sandwiches. From the start, I was surprised to see ciabatta buns instead of regular hamburger rolls. Lightly toasted, ciabatta provided the desired balance of taste and support to supplement the barbeque chicken and avoid a mess. 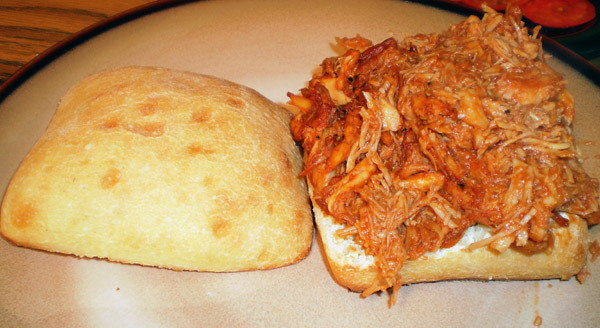 The pulled barbeque chicken sandwiches were simple, just served barbeque chicken with optional tomato slices. I had two sandwiches, identical except for a single element – the chicken itself. It was my job to figure out the difference. The only problem was I couldn’t taste anything different about the two sandwiches. Both tasted great, juicy, with a good base barbeque – both tangy and sweet. Finally I asked for the difference and was quite surprised by the simple, thought-out recipe. 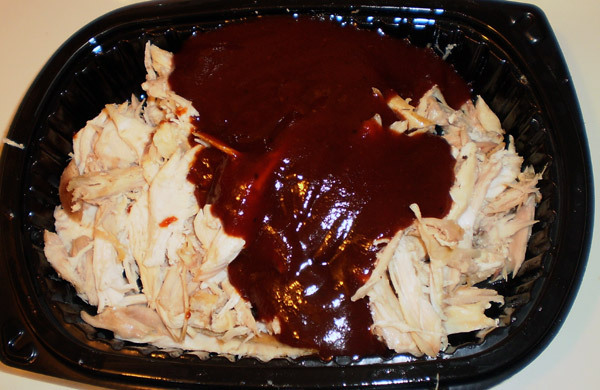 First, the sauce was prepared by combining three commercial barbeque sauces: a sweet barbeque sauce, a spicy barbeque sauce and a smoky arbeque sauce, giving the sweet, spicy and smokey taste (Stubb’s Original Bar-B-Q Sauce, Sweet Baby Ray’s Barbecue Sauce, Trader Joe’s Bold and Smoky Kansas City Style Barbecue Sauce). 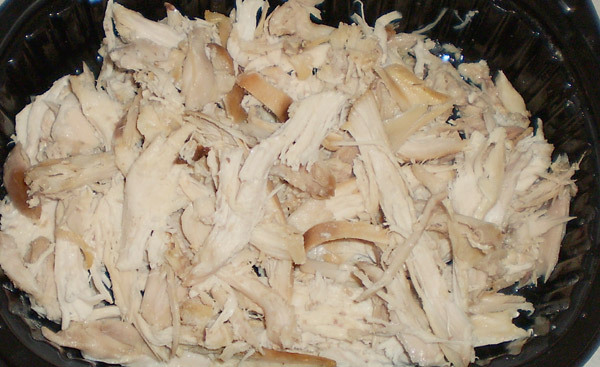 Next, two types of chicken were used: first one was organic rotisserie chicken with the skin removed and shredded whereas, to my surprise, the other was canned chicken breast from Costco. 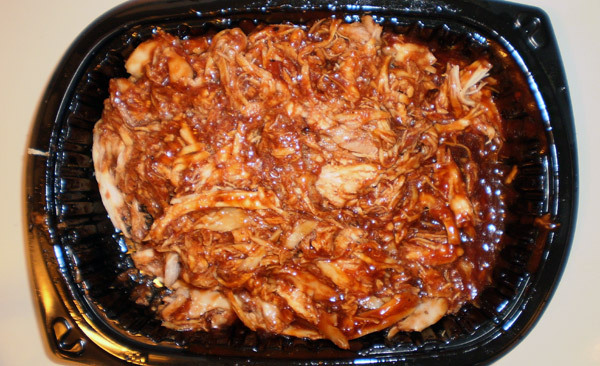 The chicken was pulled and barbeque sauce was added. 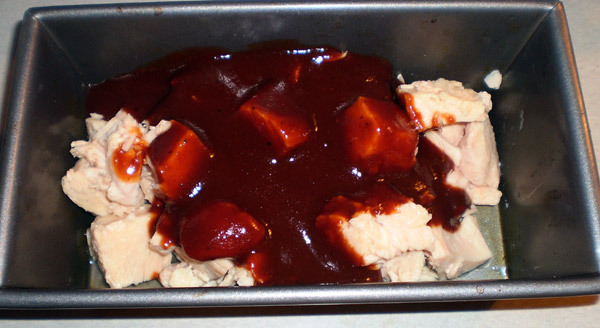 Both types of chicken had the same sauce giving them a similar taste. Then they were put in the oven to heat and keep warm. They tasted just like restaurant barbeque chicken. The best things about this recipe are the simplicity and the cost. It is easy to make, and could be duplicated easily and affordably for a larger party. And it tastes great, which never hurts when you’re in rush and eating on a budget.